Gore Verbinski’s latest film, ‘A Cure for Wellness’, is a disjointed psychological horror that’s delivery never manages to match its undoubted ambition. The film centres on a young executive, Lockhart (Dane DeHaan), who is sent to Switzerland to retrieve the CEO of his company from a ‘wellness’ spa in a remote part of the country. The spa is located in an idyllic location on a mountaintop above a small village, and Verbinski plays up the gothic elements of the setting from the outset, from the large and old fashioned design of the spa to the unusual characters inhabiting it. I was along for the ride for the outset, but the film settles into a disappointing near two hour spell that can only be described as incredibly dull before it finally unloads with a batshit crazy ending that feels like it’s been teleported in from a different, more entertaining movie. If ever a film could have benefited from sharper editing, ‘A Cure for Wellness‘ is it – you could lose 30-40 minutes of the running time and it would have heightened the tension and made for a much better film. 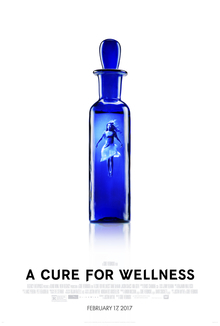 One of the frustrations I had with ‘A Cure for Wellness’ is its scattergun narrative, where Verbinski introduces potentially interesting themes then seemingly abandons them at will. I thought it was on to something really prescient and intriguing with the corporate angle and the nature of what we deem as ‘wellbeing’, but this path is forgotten about early on in order to ramp up the horror and mystery elements of the gothic setting. Lockhart is introduced as an emotionless corporate suit, focused on rising to the top at all costs, and DeHaan plays the cold detachment well (his performance reminded me of Robert Pattinson in David Cronenbourg’s ‘Cosmopolis’), and I’d have liked to have seen the film delve into this in a more sophisticated way than a troubled backstory and some flashbacks. Mia Goth (who was great in British indie ‘The Survivalist’) is excellent as a mysterious girl at the spa, and the imperious Jason Isaacs is magnificently sinister and unnerving as the lead doctor at the facility. In fact, if such an award existed for ‘Best performance in a bad movie’, I’d be giving it to Isaacs in a heartbeat. Gore Verbinski does know how to frame a shot, and ‘A Cure for Wellness’ is superbly crafted from a visual perspective, to the extent that he manages to make some of the most grotesque imagery look quite artful. It’s certainly not a film for the faint hearted and several moments made me queasy as the body horror is ramped up once Lockhart starts to uncover what is really going on at the facility. This is also part of the problem though, as Verbinski uses visual flair to substitute for narrative and pacing, and for every gorgeous shot I was looking at my watch. We’re meant to wonder as to whether Lockhart is going crazy, or whether a conspiracy does exist, a la ‘Shutter Island’, but this film isn’t on that level. It did have my attention enough that I wanted to know how the film ended, but I wasn’t invested enough that I wanted to watch the journey unfold, and ultimately Verbinski failed to engage this filmgoer for much of the film’s running time.